Our hearing instrument specialist at Hearing aid centre in Porur are overloaded with multi-disciplinary knowledge in audiology. 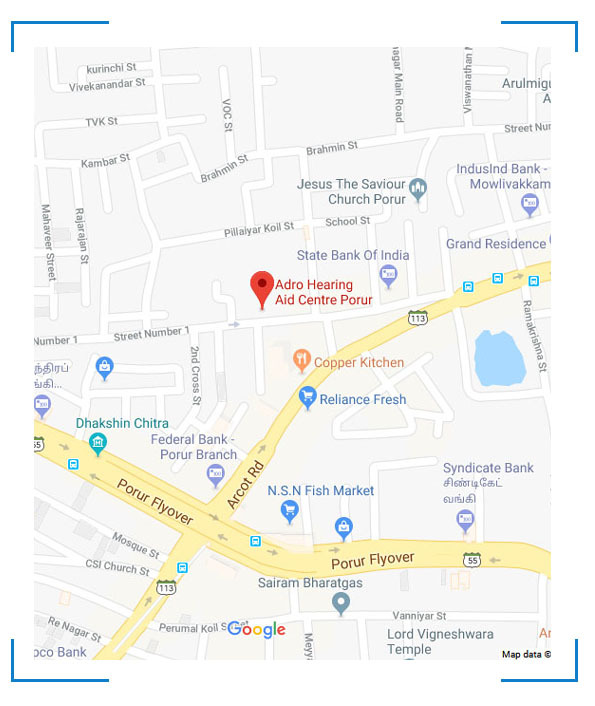 Specialized in pediatric and adult hearing aid dispensing attracts users from surroundings of Porur that include Iyyappanthangal, Kattupakkam, Vanagaram, Valasaravakkam, Moulivakkam, Mugalivakkam, Ramapuram & Maduravoyal. Chennai residents of mentioned localities can contact us for house visit service. We don’t push our patients for hearing aid purchase. We give them freedom to choose hearing aids from their preferred manufacturers. It is our responsibility to advice the best suiting hearing aid style and design with necessary features to manage hearing loss. When you purchase hearing instruments from hearing aid centre in Porur, our Porur team solemnly assures excellent service and reliability that is supported by expertise’s from audiology industry. We excel as the reliable hearing aid store in Porur. Book an Appointment Now.